Where can I buy megill spring tongue or double grip gauge pins? Since NA Graph discontinued them, boxcar doesn’t sell them and, apprently American Printing is out of stock, is there anywhere else online to get these? Are these going to be harder and harder to find due to the quads now available, or can I continue to count on them, do you think? Where there is a need, there is an opportunity. Who can fill it? NA graphics no longer supplies them because the quality from their supplier was not satisfactory. I can whittle some from sheet metal and use brass spaces for tongues. They will probably be ugly, but will do the job for me. These are not high tech. One needs to find the right spring steel and a metal fabricator that can punch out the pieces. Heating and bending the brittle steel is a challenge and looks like hand work to me. Can this be done at a price that will be fair to the buyer and make a fair profit for the supplier? In a pinch you can tape a 6 point slug on your top sheet for a gauge pin, I use them all the time on my table top presses. I have 6 boxes that have been sitting on a shelf awhile. Does anyone want to buy these? Hello, I need some gauge pins, its near impossible to get them for a reasonable price here in Germany. I would gladly buy one or two boxes from someone from here before ordering from a online shop. I’m late coming into this conversation, but do either of you still have any megill spring tongue gauge pins you’re willing to part with? Does anyone have any Megill Double Grip Gauge Pins for sale please? Or any advice on where they can be bought? Megill is owned by American Printing Equipment & Supply and it appears that they have discontinued the line. They down sized back about 2002 and in the process auctioned off both the Megill equipment and their wood working shop. When they left Long Island City, they left behind their roots and much of what they had previously sold—a reflection of a changing market. The spring tongue pins are made from a dead soft steel, not spring steel as might be assumed, and after the blank is stamped, it is then formed into the shape on another machine, and then goes through a hardening process which gives the appearance of spring steel, but in reality makes them very brittle. The raw stampings are put through a deburring process in a rotary tumbler to debur them. As to their future availability, that’s up to American at this point. Back around 2002 Howard Bratter took these photos of the making of Megill Gauge Pins at American. It was a one-at-a-time operation using ancient stamping presses with each piece hand fed in to the stamping machines. It was nothing fancy or automated. I was told a while back by someone at American Printing Equipment that the McGills pins they were selling were produced in Mexico and that the factory had shut down unexpectedly. I don’t know what happened to the machines, but I’d imagine nothing good. Does anyone have a favorite bent steel pin design? It may not be too difficult to tool up for a simple design. Patent rights should not be at issue, just trade name. It seems to take the *Good ole Boys* Stateside, a very long time to catch up, I.E. 30/40/50 years since we were making our own Gage pins, Register pins.?? Simple as, Ladies BUN PINS or BOB KIRBY Grips, virtually ready made,!! … (usually pilfered from Granny). All we did was to mount the *grips,* with the loop to guide the stock. In either case with as much or as little protrusion as the stock required. + the Pins have factored in, tiny plastic nodules at the leading ends, which when mounted can be used (a) as the loop or (b) mounted 180 degrees for feeding heavy stock. The method of mounting was as simple as setting the BUN Pins in small blobs of *Transpalite* i.e. 2 pack Epoxy Resin, as in, encapsulating exploded/dismantled Watch Parts for paper weights etc. *** Any size, any configuration, any crank to suit the stock, although Bun Pins etc, are sprung steel and have a memory, up to a point, with 2 small pairs of Nose Pliers it was and still is no problem to re-configure. I can’t quite figure out what you are describing. Could you possibly add a picture? This good ole boy can’t follow Mick’s little narrative either. he likely has a fresh hack to offer. Hardware stores must have many parts that look like shallow shelves with a pin. It also wouldn’t hurt to check shops like Michaels & Hobby Lobby. That dab of sealing wax or epoxy can take care of the rest. I like the idea of those stick-on paper and foam core “pins”. Teaching elective letterpress to a class as large sometimes as 15, it’s a struggle to be everywhere at once. So, even after glowering admonishments about never pulling a proof w/o my first-hand approval, it will happen anyway— which sometimes has resulted in crushed type & cracked gauge pins. The paper/foam pins are like to do less damage and are easily homemade. This is a kirby grip. Also hair grips or hair slides, they must have them Stateside. Mick is the master of the long way round ramble, his heart is in the right place though. Most of us will use one word whereas dear old Mick likes to use 4 or 5 or 17. I actually haven’t seen them used in the UK but other things like paperclips and bent wire to do the same job. 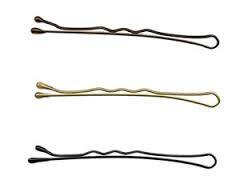 Anyone wanting to use “bobby pins” that’s fine and dandy. I do have a few original spring tongue gauge pins from Megill’s in my stock both new and used. Call me if any interest.